There’s just something comforting about good-ole American cooking! After the supercharged excitement of snow and water sports what hits the spot better than barbecue chicken, a heaping mound of mashed potatoes, and a nice tall glass of iced tea? Whether you’re looking for fresh fish, or a juicy burger and fries, there are plenty of Lake Tahoe restaurants serving American food all around the lake. And because American food is all about a comfortable style and an easy-going atmosphere you probably won’t have to get gussied up to dine at even the most formal of these restaurants. Just pull on your jeans and a tee, pull up a chair and relax with good friends and good food. You'll want to sit on the water if it is a lakeside restaurant. Meat and potatoes epitomize classic Americana, and the steak house stands at the top of the heap. These four-star Lake Tahoe restaurants serve all manner of embellishments to the classic meat-and-potato dish, including garlic mashed, filet mignon, hearty gourmet pork chops and more. You’ll also find plenty of succulent seafood, like king crab legs and salmon. We love our fish here. 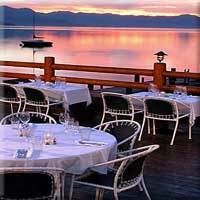 Lake Tahoe restaurants often offer fabulous views while dining. This from Sunnyside in Tahoe City. Prices for American style Lake Tahoe restaurants vary dramatically. Family-style establishments are typically less expensive, while steakhouses can certainly end up demanding a bit more. Either way, there are plenty of Americana options for dining in Lake Tahoe for you to choose from!